I have a few foods that I have fond memories of. They continue to be my favorites throughout the years. This got me thinking… what makes food memorable? It is simply the taste of it? Or more of what we associate with our food experiences? Every time I have hot chocolate I’m taken back to when I used to ice skate with my girlfriends. 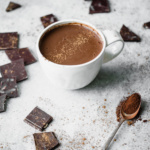 We’d grab a cup of rich creamy hot cocoa with excessive jumbo marshmallows, whole milk, and all things that fitness magazines say we shouldn’t have. When I want to indulge in things like that, I remind myself that I’m just living life. You know, enjoying those simple moments filled with laughter, good food and friendship. In fact, those moments are building memories. So damn right, I’m having that hot chocolate! With extra whip cream thank you very much. Often times I wonder why I find pumpkin pie to be the best dessert on the planet. I mean, it’s so simple! But eating pumpkin pie reminds me of the first time I made a pie by all by myself. How I crafted the crust with such determination. In that very moment, I was discovering my passion and creativity for baking. So really it’s not the dessert itself, it’s the memories that come with each bite. Now it’s my soul food; it feeds me happiness in the form of good memories. To date, one of my favorite meals was scallops with spaghetti squash, roasted red peppers, with this incredible creamy sauce. It was finished with a chocolate soufflé and rich chocolate ice cream. Which of course I devoured. I think it’s memorable to me specifically because of the person I was with. Time spent with good people can make food special. This I know to be true. 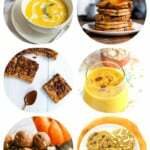 Just think about some of your favorite foods. Or the best meal you’ve ever had. It was probably more of an experience and memory rather just based on taste alone. Okay and one last food memory of mine… I must confess that I absolutely adore bread. Oh my goodness, in any shape or form. During the holidays I used to live for my Grandmother’s buttery croissants. I can still remember the taste of them and how they used to just melt in my mouth. These days I try to eat bread less, but I still don’t think I could live without a slice (with creamy whipped butter… omg!). Sometimes I get serious cravings for a slice french bread. 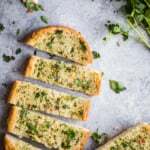 It’s my favorite and I love dipping it in marinara sauce, making garlic bread for a side, or even French bread pizzas! I would have serious withdrawals if I ever stopped consuming it. Call me the carb queen. Whatever! 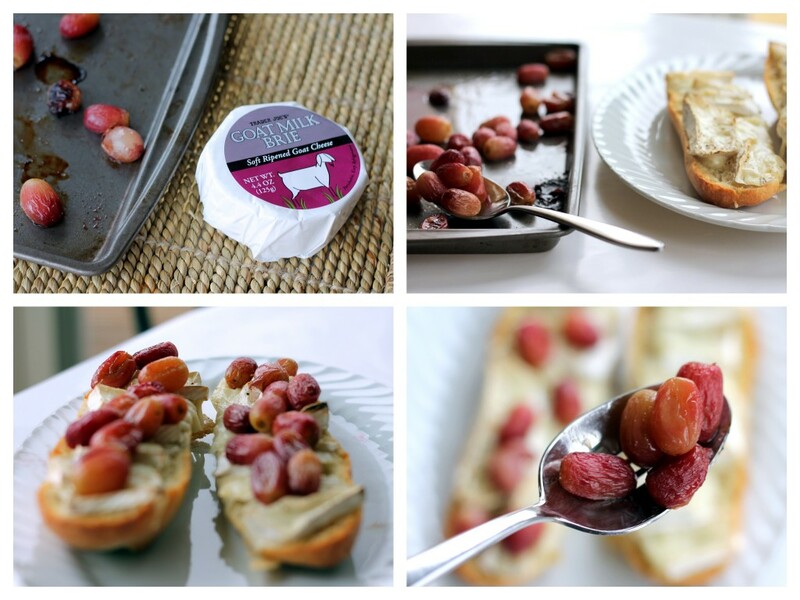 I must tell you that roasted grapes, creamy brie cheese, and honey is one of the most delicious combinations that could ever be put on bread. 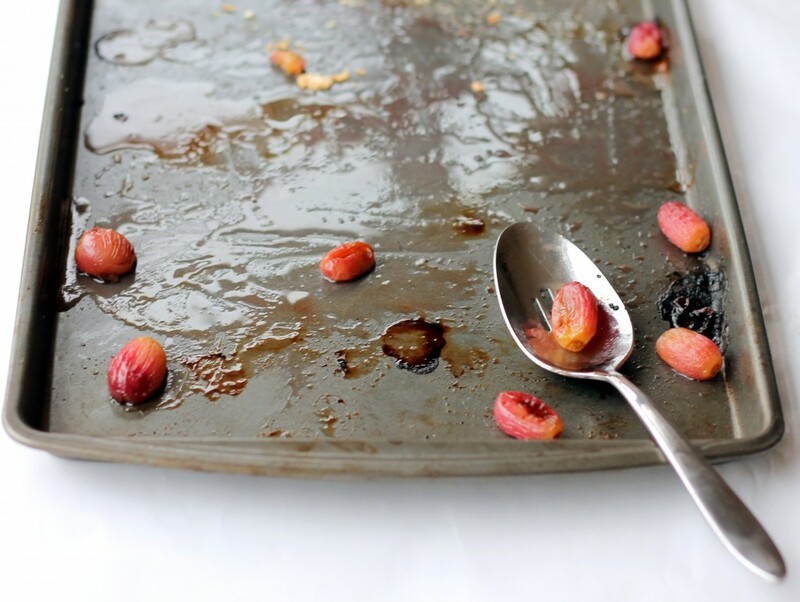 I don’t know why I haven’t roasted grapes before, but they are sweet and perfect in every way. I also decided to slice the french loaf lengthwise for this crostini, because I love toasty crunch on the outside of the bread, while still having a soft middle. Mmmmmm…. HOLD ON. I almost forget about the sea salt. Which you obviously know I put on most sweet things to make them a million times better. 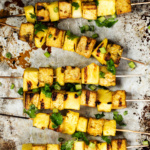 This is a seriously delicious appetizer (or snack!) that you won’t forget anytime soon. 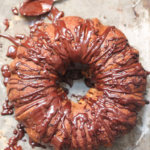 A perfectly delicious sweet and salty appetizer. 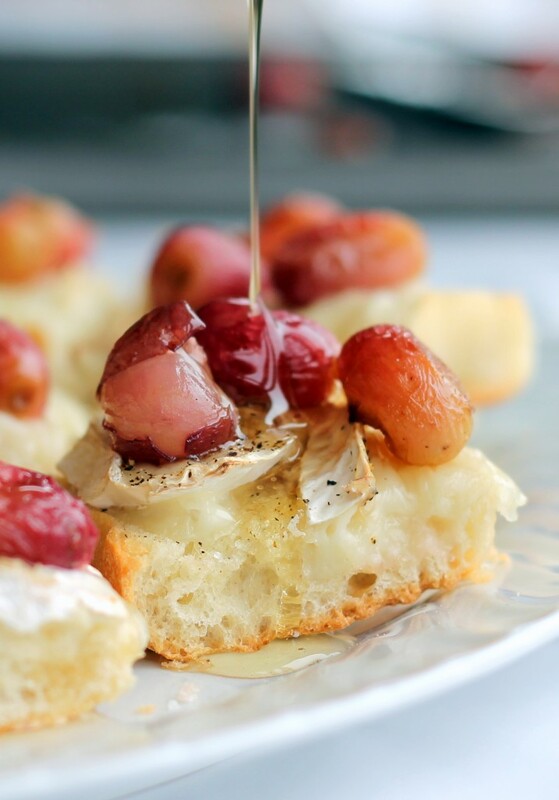 Preheat oven to 400 degrees F. Place grapes on a nonstick baking sheet and drizzle with 1 teaspoon of olive oil. 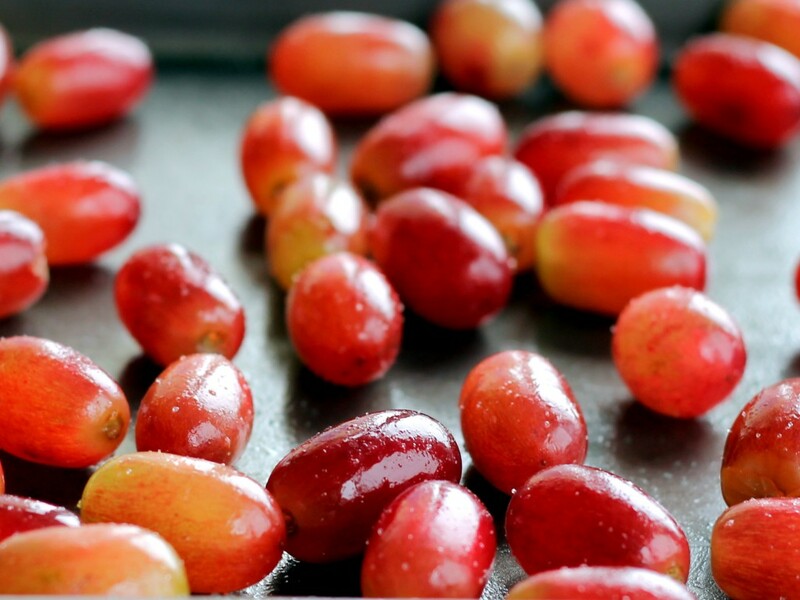 Toss to coat grapes evenly and roast for about 15 minutes or until grapes begin to look like they might burst and shrivel a bit. Set grapes aside to cool. Keep oven temperature. Place bread on separate baking sheet and brush each half with remaining 1 teaspoon of olive oil. 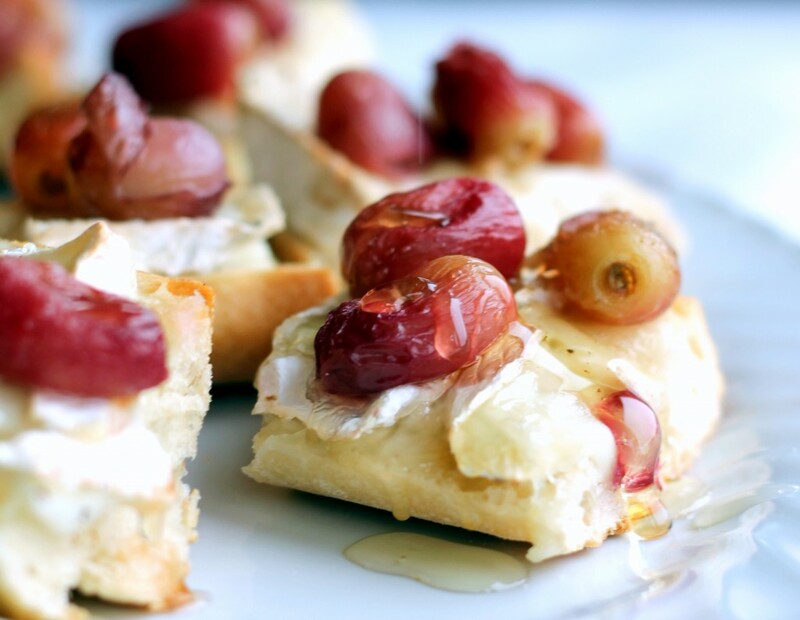 Top each with brie cheese slices and bake for 10 minutes. 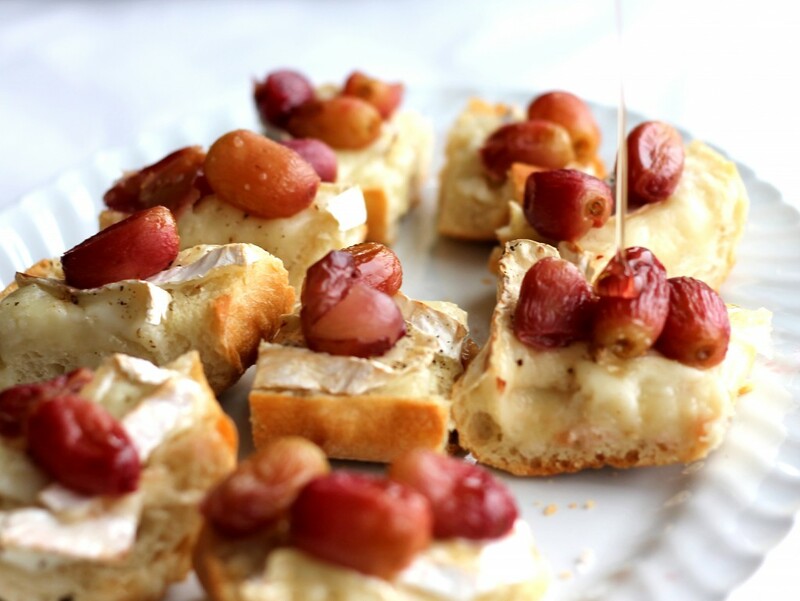 Turn oven to broil and broil for 30-45 seconds until cheese melts and bubbles. 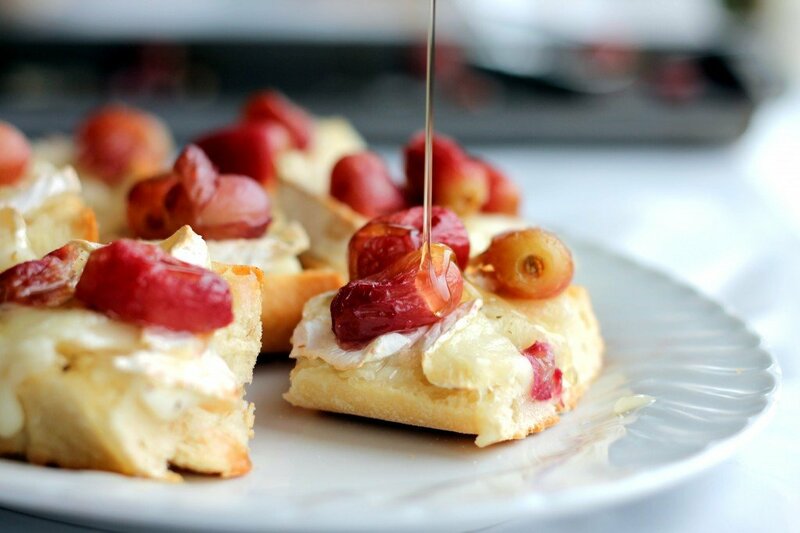 Add grapes on top of cheese and drizzle honey all over. Sprinkle with a bit of sea salt. 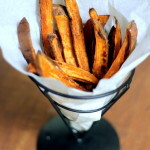 Cut bread into wedges and serve. Feel free to double or triple the recipe if you are making for more than 4 people. 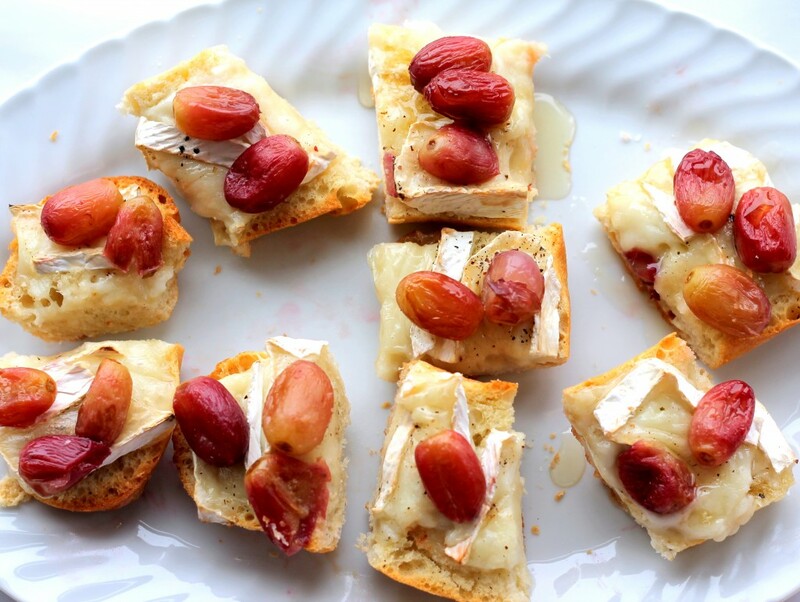 9 Responses to "Roasted Grape & Brie Crostini with Honey + Sea Salt"
The French…including French women…would never consider you a “Carb Queen”…but as NORMAL.. Sometime the simplest things are the most memorable. Taste is a sense that is close to smell the oldest olfactory connection to memory. Like smells , taste triggers and immediate association. I can’t wait to try this combo. I totally know what you mean, I just freakin love bread. I eat something with bread, or some type of bread at least once a week. Bread is amazing, period. Now, this crostini looks tasty! I had been eyeing this recipe for a while, tried it tonight and ooooooooooh, so simple yet so delicious!!!!!!!!! Love it! done this recipe but replaced the bread for a puff pastry “vol au vent” (kind of haha. I had some unused pastry left from a quiche). 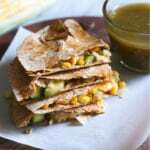 Great, really easy and absolutely tasty. Thanks!